Athletic Bilbao’s ambition to maintain their fourth place spot was held at El Madrigal after Marcelo Bielsa team’s only grabbed a point against home team Villarreal, forcing the Basque side stuck at fifth place until another week. The Yellow Submarines’ Brazilian striker, Nilmar was the main culprit that held Bilbao’s mission as the forward scored the equalizing goal which simply canceled out the visitor’s earlier lead. Having different ambitions in the league, the match between Villarreal and Bilbao turned out to be an interesting battle as the home team are looking to get away from relegation zone, while the visitor are targeting fourth place spot. The home team managed to take the lead first though, as Marco Senna curling free kick thumping right into Gorka Iraizoz’s goal, without giving any chance for the goalie to do something about it. 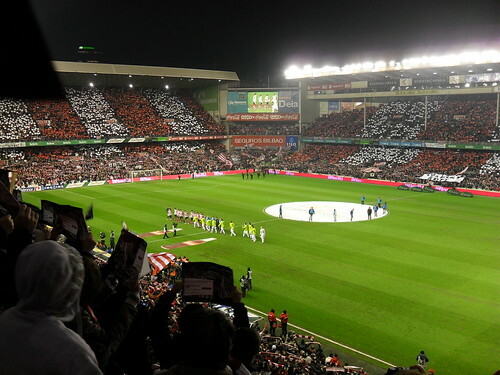 Senna’s goal remained until the break, forcing Bilbao to change things around right from the re-start as Marcelo Bielsa brought on Fernando Llorente in start of second half in an attempt to improve his team’s attacking display. That attempt work to a success when the Spain international eventually bagged the equalizing goal for his side in around the 62th minute when his header from Toquero’s cross beaten Diego Lopez on the home team’s goal. Bielsa’s team were spurred on by the equalizer as they pushed forward for the second and eventually grabbing it four minutes later, when Susaeta broke free and beat Lopez in a one on one situation. Unfortunately for Bilbao, their lead didn’t last long as Nilmar equalized two minutes later after successfully capitalizing on a defensive error from Martinez, before scoring the goal that helped his side’s effort in staying away from the relegation zone.